There’s a fine line between seeing the cinematic potential of a book and simply seeing it as a means to your cinematic end. Director Stuart Paton, and the producers and technical masters who helped him film 20,000 Leagues Under the Sea, so many years ago, seem to have missed that distinction; however well-intentioned their effort. Their victim (particularly hapless, given that he’d died 10 years before) was Jules Verne. Verne’s 1870 novel, the harder-to-spell Vingt Mille Lieues Sous les Mers (Twenty Thousand Leagues Under the Sea), had been a hit with three generations of readers already. It tells the story of the enigmatic Capt. Nemo (Latin for ‘nobody’); a conflicted anarchist who patrols the oceans in his submarine, the Nautilus. Nemo’s crew is convinced of his brilliance, and rightfully so: the craft they're floating in is pure science fiction. By 1914, of course, Verne’s speculations were being bluntly realized. German U-boats were sending British vessels to the bottom of the sea, making the power of the submarine publicized fact. Movie-makers, therefore, had the weight of the moment, a dramatic vehicle (literally) and by this time, the means to film it. What did they produce from Verne’s book? A lot—and again, very little. 20,000 Leagues Under the Sea, it turns out, is first, and only, about spectacle; committing to screen only those portions of its source material that lent themselves to state-of-the-art special effects and photographic dazzle. No doubt impressive in their day, these scenes leave the movie with little for posterity. In other words, they’re no big deal to us. Would Paton be surprised by this? I suspect not, since the film announces itself, proudly, as a product of various technical breakthroughs. It's implied, in any kind of hyperbole like that, that another breakthrough will one day come along. Example: The film’s opening intertitle declares the submarine scenes to be “directed under the personal supervision of the Williamson brothers, who alone have solved the secret of under-the-ocean photography.” Footage of the Williamsons, George and Ernest, comes next. One wonders what secret the Williamsons will solve next year. There’s a feeling of medicine-show oratory to this, as though we’re about to see some new benchmark of cinema unveiled. However, the director’s use of prescriptive intertitles (that is, intertitles that describe a scene before it's shown) make the film feel old-fashioned right away. The characters, too, seem like transplants from an earlier period of movie-making. They're played broadly, without sensitivity, and when set in naturalistic environments, rather than consciously theatrical ones, their fakery is extreme. Capt. Nemo (Allen Holubar) observes, commands, exhorts and broods with the subtlety of an opera diva. His presentation isn’t helped by a generous layer of blackface makeup (or ‘brownface,’ as he’s meant to be Indian? ); nor his beard, which seems to be made of cotton balls. 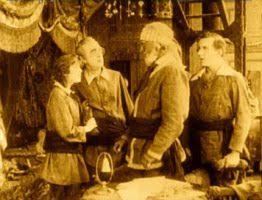 Nemo’s submarine takes on its first set of captives when it rams and sinks a vessel carrying a scientist, Prof. Arronax (Dan Hanlon), his daughter, and an ace harpoonist, Ned Land. In Verne’s version, Arronax serves as narrator. In this film, however, he’s just one more member of a swollen cast, whose main role is to be someone Nemo can explain things to (and by extension, to us). He does little else. 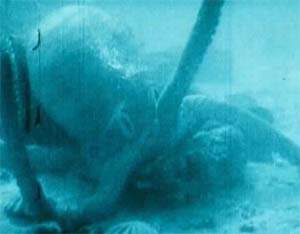 20,000 Leagues does give us wonderful sights, including a well-shot and creative shark-hunt on the ocean floor. But Nemo's captives are most transfixed by the sub’s crystalline porthole, which allows them to observe the sea bottom from the comfort of their cushions. We’re expected to share their awe as the camera abandons the actors and pans along the seabed, past rocks and seaweed and fish for, it seems, several minutes. But we’re an audience used to colour photography of ocean depths far deeper and stranger than this. Meanwhile, a balloon filled with Union soldiers crash-lands on a mysterious island, called Mysterious Island. These soldiers find it uninhabited, except for ‘A Child of Nature’ (Jane Gail). The Child lives in the trees and seems blissfully at-one with all the creatures around her, even the leopards. Or maybe not, since she wears a leopard-skin dress. The Child moves likes she’s part of an interpretive dance troupe, but otherwise, she's not that weird, considering. We sit through the comedy and hope for a quick return to the sub. Instead, 20,000 Leagues Under the Sea drifts in a third direction, introducing Charles Denver (William Welch), a wealthy alcoholic with a big yacht. Denver has a checkered past, which the movie wastes no time revealing in flashback. His memories have made Denver a morose man, although in his case, guilt is probably a good thing. A mysterious beauty and a crew of intrepid soldiers trapped on an island, with the movie’s entire remaining cast distributed between two boats. The threads of plot converge from there. 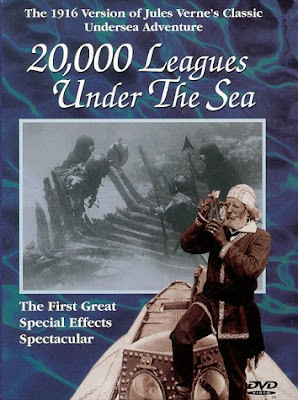 There are two reasons to recommend 20,000 Leagues Under the Sea. First, the almost poetic parallel between the aims driving Capt. Nemo and those driving the director himself. Both believe themselves possessed of something new and spectacular, and greatly need an audience to show it to. However, we might ask the filmmaker, just as we would ask Nemo, if the wonders he shows us are worth the sacrifice of so much else--referring, in Paton's case, to story, pace and even aesthetic. Given time, everything new grows old, and the images that last are those rendered with an artistic hand, not just a proficient and—at the time—innovative one. Which brings me to the second reason. Late in the film, we travel to India, to the past, to the circumstances during and after Denver’s crime. We are told of an uprising by the commoners, a brutal crackdown by the elites, and the betrayal of a good man. Using a fakir in ecstatic trance as a central image, Paton delivers a series of ingenious, powerful scenes, including an overhead shot of the elderly fakir dancing within a circle of drummers. The artistic, technical and emotional complexity of this six-minute bloc dwarfs the rest of 20,000 Leagues Under the Sea, and it’s really the only part I want to see again. No small irony, that. The movie’s greatest scenes are on land. I saw the film at a special live showing; part of the Toronto International Film Festival (TIFF). It is available on DVD through Image Entertainment.